"This Italian sausage and ground beef recipe is full of vegetables and Italian herbs -- the longer it cooks the better! Full of flavor, and makes a great base sauce for lasagna. It's critical to use fresh basil, other herbs may be dried. Do not use canned tomatoes which have any corn syrup in them. Home canned tomato equivalent is 3 quarts. 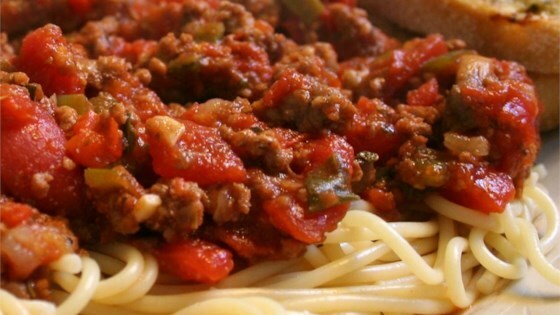 If you want a spicier sauce add either crushed red pepper to taste or use hot Italian sausage." In a medium skillet over medium heat, cook sausage and ground beef until brown. Drain, reserving 2 tablespoons drippings. Set aside. In a large stock pot or Dutch oven heat oil over medium heat. Cook onions in oil until translucent. Stir in green and red bell peppers, zucchini, mushrooms and carrots and cook until just tender. Add browned sausage and ground beef. Stir in basil, spinach, thyme, oregano, garlic, sugar and salt and pepper. Cook 2 to 5 minutes. Pour in tomatoes, stir well, reduce heat, cover and simmer 3 hours, stirring occasionally. I recommend not adding the fresh basil till the end. 3 hours in sauce will just kill the whole point of adding fresh herbs. Yum! I ended up blending about two-thirds of the sauce to make it smoother and to "hide" the veggies from the kids. Everyone liked it! I modified the recipe for cooking in a slow cooker. It came out very well!